I picked this slim, hardback book while browsing a stand at the York exhibition last week. For the princely sum of £1 I became the owner of one of the more unusual books in my library. Published in 196 by Ian Allan Ltd, this looks like the sort of thing aimed at the younger end of the market. If it is, then it can't have been a best seller. Both steam and diesel locomotives draw thier power in the first place from heat. There is no sign of this in looking at a diesel, for the heat is generated inside the engine itself. Anyone who has pumped up a bicycle tyre knows that the pump barrel gets hot. Idoes so because the air is being compressed by the piston. In a diesel engine the moving pistons compress air inside the cylinders, making it hot enough to "fire" a fine spray of fuel oilwhich is pumped in at the right moment. Imediatly, the space above the piston in the cylinder is filled with hot, expanding gases which "enlarge" the narrow space in which they are trapped by driving the piston to the opposite end of the cyclinder. The diesel therefore belongs to the class of engines called "heat engines". Those are the first words in the book ! There's no messing around here. By the end of the book, if you have been paying attention the reader will be able to understand all the principles of not only the power plant, but most of the ancileries. Bothe diesel-electric and diesel-hydraulic transmissions are considered. Diesel-machanical gets less coverage but you will know how a dog clutch works and have ploughed through many pages of diagrams. Pick up a lump of steel and you can probably whittle yourself a working railway locomotive using only a swiss army knife. Now I have an idea exactly what I'm building when working on the Class 26 bogies. As far as model making goes, all those springs are just for decoration. Now I have some idea of what they do, the rather confusing collection makes some sort of sense. This is important if I want to model things properly, or at least it makes things a whole lot easier. 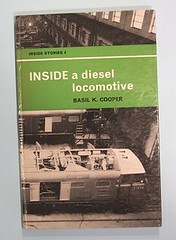 At 62 pages, this is a very complete and concise guide for anyone who wants to know how a locomotive works beyond "A driver gets in and turns on the power" noddy style publications. Worth seeking out on the second hand market IMHO. 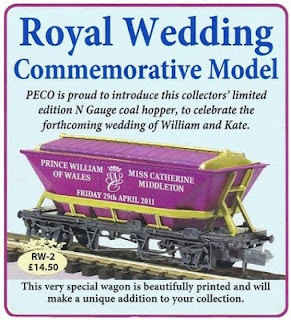 Congratulations to Peco for producing what must be the most innovative souvenir of Will & Kate (or is it Catherine)'s wedding today. 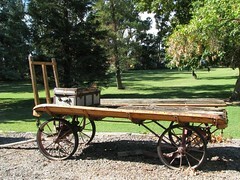 A limited edition CDA covered hopper wagon. The logic is that these things run in Cornwall and are normally filled with the groom's Dad's biscuits. Or something. Actually I think it's a very, very clever idea by Peco's marketing department to get their product appearing in the "normal" press in the "Look what those weirdo, wacky trainspotters have come up with for a wedding souvenir" section. There's a good chance that it will become a sought after item in the way that mugs, tea towels and empty biscuit tins won't. Whoever came up with this idea deserves a pay rise as it's so far out as to be genius. If you want one, try here. On a nice sunny day, what better way to spend some time playing with the garden railway ? Some time ago we bought one of those micro video cameras I pondered last year and it seemed like a good idea to clip it to the end of a wagon and shove this around the line to see what it looked like. After several attempts and quite a bit of fiddling trying to make the stupid thing work, the result is shown above. The flash card has to be pushed in a long way to make the camera work. Further than you can poke it with your fingers. If the card is full, the camera won't start recording but it's not obvious and certainly not mentioned in the instructions. You need something stronger than the handrails on the veranda of an LGB 4-wheel van or the scene appears to wobble alarmingly a bit like Douglas Adams description of the sea being still and the buildings washing in and out. 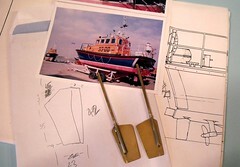 I have a plan of the Brede lifeboat. I have photos. I needed rudders. The plan is 1:20th scale and the boat I need rudders for is 1:12th. My plan was to make the blades up from some brass sheet I had for model railway work. The shape is odd with not a right angle to be found, but by sketching it out on literally the back of an envelope, I was able to calculate the new dimensions by multiplying those on the plan by 1.6. The results looked like they would be OK. I tweaked a few numbers for a slightly larger rudder to improve turning on smaller pools and started hacking away. First lesson learned - 1mm thick brass might seem like a good idea but it's bloody difficult to cut compare to the thinner stuff. My Olfa Plasticard cutter scored it but I still needed the attention of a piercing saw (2 blades broken) and tin snips to get the basic shape. Then there was some filing to smooth up the edges and round the corner a-la the prototype. The pivots are 3mm brass rod. I'd hoped to cut a slot up the middle with a junior hacksaw and slide the metal in. It quickly transpired I don't the skill for this and so I just filed half the rod away and soldered it to the blade. That seems to be nice and strong. This is topped with a little collar made from tube. This rubs on the tube set into the hull and should help keep water out. These turned out quite nicely. Proper scratchbuilt jobbies and not too bad for a couple of hours work. Lesson 2 - all that metal holds heat. So I type with burn fingers because I tried to pick the newly soldered parts too early. Twice. I think that probably says something about me. If you've been reading this blog for a very long time then you might just remember that I started building a Brede Class lifeboat. The model currently has a scratchbuilt hull, which I'm very proud of, some electric gubbins and a few castings. Apart from that there's not been much progress for a longer than I care to think of. It seems I can't escape the class though, because a few weeks ago, I was offered a 1/12th scale kit for the same class. Actually, someone tried to place an advert in our boat club newsletter and as the editor (read: bloke who does all the work on the thing) I learned about it before anyone else. The boat was described as part started which is always a cause for concern, but the price looked promising so in a car park at one of our boat club meetings, a deal was done. The model turned out to a good 'um. It's a Models By Design kit, well set of assembled mouldings. The propshafts and rudder tubes are fitted. Some painting has been carried out and the windows holes are started. My Dad took one look and decided he'd like to have a go at this one, which suits me as it means I have to do less work to finish it off. Checking the work so far, it all looks OK. The prop tubes are nicely parallel. as are the rudders. The later aren't in line with the centre of the propellers by an amount that would indicate this is a deliberate step rather than accident. Rectifying this would be an awful lot of work so I'll see how the model handles before deciding. Despite being a small prototype, this is still a chucky model. My 1:20th size version is a lot easier to handle. Still, it is on the upper limit of being easy to move even if it does take up a lot of space on the workbench. I'm writing this in an effort to remain topical having just got back from the show. It has been a very long day so I'll stick to bullet points. The layouts got better the higher you went. That's not to say the stuff on the ground floor wasn't any good, it's just that my favourites were on the top floors. The best layout, in my opinion, was the 3mm scale Everingham. Looking at it I can't understand why we bothered with 14.2mm gauge when 12mm looks as good as it does here. Soldered track helps a lot by keeping the rails small. Best stock had to be the Sealane trams. Fantastic models built from cardboard, perspex and bits of metal. See the current Railway Modeller Mag for details. The trade was good as ever. I picked up a couple of magazine projects and could have spent considerably more. If you chat to lots of people then it is easily possible to spend 6 hours in the show and still not really have seen all the layouts properly. Carpet is much nicer to walk on than concrete. My friend Tim's RoadRail bus is a sight to behold. I really want a Colin Flannery kit to build one just like it but can't really persuade myself I have a use for it. Mind you, Tim turned down £400 for the completed model so maybe there is room for a RTR version. Bachmann's new 3F looks like it is going to be very good. To stick high density foam together for scenery building, you need Hot Wire Glue from TerraScenic. Mike Cook is very much still around. The tea in the exhibitors tea bar has improved since I last drunk it. The fish and chips is very filling and reasonably priced. Apparently the beef wasn't so good, dodgy vegetables apparently. 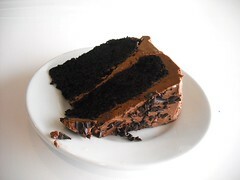 The chocolate cake was heavier than you might think and a touch sickly. OK but I couldn't manage a second piece without an hour or two between helpings. If you miss the M18 junction it adds an hour to your trip home. More photos on Flickr. I seem to have picked up on a lot of wierd stuff. DCC - A new religion ? Well, it's Easter so let's talk about religion. Not in the sort of way you might if you wish to rid yourselves of Jehovah's Witnesses on the doorstep (Yes you can come in and tell me about God but I will insist on an equal time spent with me talking about modelling the GWR in P4. We'll see who cracks first.) but to highlight a new religion that seems to be sweeping the world. I am of course talking about the church of DCC. Digital Command Control, for uninitiated, is a new(ish) way of controlling toy trains. Each loco has a little electronic chip inside it which listens to the commands sent from the computermebob controller. This device can also run points, signals and sound should you wish to do so. All the major manufacturers have a system you can buy along with lots of specialist DCC makers. Thanks to some nice common standards all the controllers can run all of the chips allowing the modeller to chop and change between makes. Now I don't mind a gizmo or two. I was an early adopter for DAB radio with an expensive walkman size device. This taught me a lesson and I became an early abandoner 'cos there's b****r all signal around here even outside the offices of the company who provided the transmitters. Not to worry, I have a small craving for an iPad and if I the money was freely available would happily stump up for all sorts of junk as long as it has an LED on the front. Despite this, I don't do DCC. Partly because I can't be bothered, partly because I don't want to spend the money putting chips in my locos, partly because I don't see any benefit for the sort of layouts I build, but mostly because many of the people who do use it won't shut up about it. It seems there is a type of "modeller" who on purchasing his DCC controller, decides what he really needs to do is build a demonstration layout to show people the benefits of DCC. Not build a layout that just happens to use DCC but a plank with track specifically to show off the new toy. There are at least 6 different examples touring the exhibition circuit and that's just the ones that have done more than one show. I know at least one club building another. All come with laminated diagrams explaining how to use the new magic power. Worse, model railway magazines are full of it and there isn't an online forum that doesn't have a DCC Zone, you can't escape. People say with confidence that it is the future in the same way that today I would say that Tuesday is the future. I'm sure that there are plenty of newer modellers who don't realise that there is a cheaper and judging by the questions that seems to be asked, simpler, method of making model railway work. Maybe I should join in. I could stand behind my demonstration plank showing how I can achieve movement with only 2 wires and a controller that costs less than a couple of chips. Will I ? No chance, much better things to do. And another religious parallel. All the major faiths seem to have a way of making a lot of noise. Church Bells, calls to prayer, brass bands and now train noises played at full volume. Turn it down I say. Or at least I would except you probably wouldn't hear me over the roar from a OO gauge Class 47 who's owner doesn't understand that you have a loud control 'cos he can't be bothered to read the manual or just wants to show off his latest toy. At least real religion has given us chocolate eggs. Don't get that with DCC do you ? It's a lovely day outside and I'm sure you'd rather be out there than reading this stuff, so just a quick post. The Isle of Man G Van had been sprayed with Humbrol 64 (Pale Grey) paint. A couple of coats of white on the roof by hand doesn't give a perfect finish but I think this model is going to get some weathering in the future anyway when there is a railway layout to run it on. I've always wondered why railway companies went for white, surely it's the one colour that isn't going to survive unscathed when living with steam trains for very long ? Finally the strapping was picked out in black. This is the reason I used No.64 rather than just primer. You can keep the paint you don't use for touching up dodgy detail painting later and be confident it will match exactly. Actually, this wasn't the last job. I had to paint the number on the side. Manx van numbering style varied a heck of a lot and while I could use transfers, it doesn't seem to be worth the effort. I'm quite pleased with the results too. While I wouldn't hand number a loco (not enough skill, by a long way) I don't mind wagons. It seems a bit more natural to do it. That and a coat of dirt hides a multitude of sins. A decision still to be made is the type of coupling I should use. If anyone wants to make any suggestions in light of their own experience with 4mm scale narrow gauge model railways, please comment away. If I have to chose between rolling stock that looks good or works properly, I go for the later every time. Visitors to exhibitions will hardly notice minor foibles such as wobbly handrails or other errors that exercise those on model railway forums, in the context of a completed layout. What they do spot is the things falling off the track all the time. I can't say for certain that the Manx G Van would have had running problems, I just felt that the way things were going there was a pretty good chance. So I broke the whitmetal bits away from each other and looked for a plan B. In this case a separate chassis seemed in order. This isn't sophisticated, just a rectangle of plasticard with the axlebox casting stuck to it. With the wheels in and rotating freely and solebar was made from very thin plastic. A little thinning of the body casting allowed this lot to drop into place. The floor makes the model ride about 1mm too high but I can live with that. In fact it's less of a problem than you'd think as with all the bits fixed and dried, I thinned this down by rubbing it on a sanding block. The brake gear is straight out of the kit. The lever needed to be shortened a bit but a quick snip with the wire cutters sorted this. 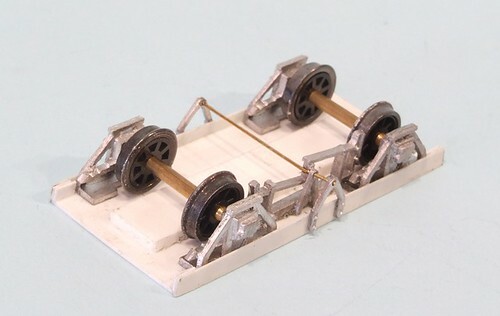 Anyway, all the wheels touch the ground and it runs along the modelling board nicely. If I find a bit of 12mm gauge track I'll give it a proper test. 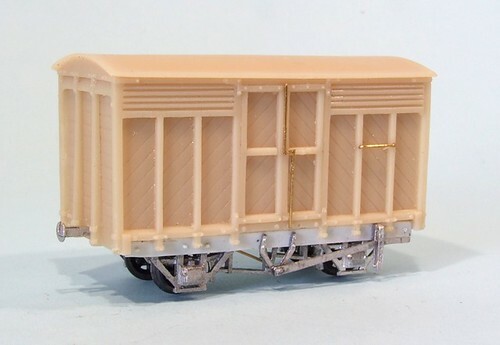 Opening the box on the Branchlines kit for the Isle of Man railways G Van everything looks very promising. 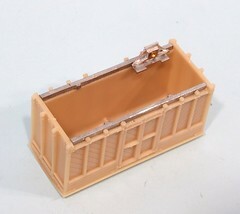 The main component is a very nicely moulded resin body. It's a cracker with lovely modeling and not a hint of distortion. Since the kit has been "maturing" for at least 3 years this is really good news as it shows the material to be very stable. Some of my own efforts in this direction have become static models after a similar length of time ! According to the instructions, the builder just sticks the solebars to the body and then adds the axle boxes. Well, I stared at the instructions for ages. Then I tried a dry-run and it sort of located against the thin lip of resin showing behind the whitemetal solebar. Nothing ventured, I opened up the superglue and got stuck in. The results were underwhelming. Keeping the solebar straight was tricky and I'm not sure I managed it to a high enough level of precision, not helped by the moulded bolt heads conflicting with some of the bodyside bits that extend below the floor. The location of the axlebox wasn't marvelous either and it definitely didn't feel secure no matter how much glue was involved. The presence of feet that should sit on a floor, but no sign of a floor or anywhere to fit it didn't inspire confidence either. Finally, some rough tests seemed to show that if I put an axlebox on the other side of the van, the gap left between the bearing cups would be less than that required to fit the axle. I needed another plan. More old style modelling. This time the removal of the grilles on the sides of this model locomotive body. Those supplied look like they were glued on the side of the body when making the master. On the real loco they are flush with the body side. I wouldn't mind so much but they don't even look like they have been glued on perfectly square ! Anyway, removal is simple enough. Drill a lot of holes and then join them up by waggling a knife blade in each. Then file away the remaining plastic to leave a nice rectangular gap whilst simultaneously weakening the plastic molding. All I have to do then is fill it with some etched brass. Now some of you are looking at this and thinking it's perfectly normal. Others are wondering what the hell I'm up to. It's been years since your Horbachmaeljan loco needed this sort of work carried out. This really is keeping the old skills alive ! Starting work on the Class 26 diesel, I get to make progress on the biggest difference between the Class 33 body and the loco I want to build - the nose. As far as I can tell, the main change required is to add a set of doors in the middle of the face. These stick up into the windscreen, reducing the middle window by half it's height. For this I squared off the bottom of the window and made a plasticard door top. Above this is a bit of microstrip for the window frame. The construction was glued in place with superglue and left to set. 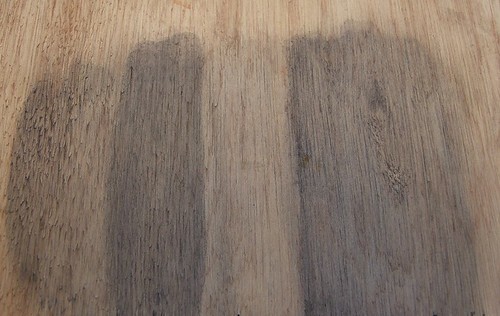 Once dry, the area was filed away in an effort to loose the join. Next, there was an odd line around the windows that extended back down the body. I suspect this dates from the era when plastic ridges were used to delineate the paint lines. 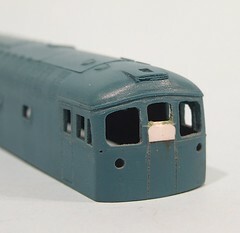 You can see this on older models where there are odd ridges and lumps visible when the BR blue livery has been applied. You even see moulded square brackets to show the position of nameplates even when they aren't fitted. Back in the good old days, detailing articles were full of instruction to pare these lines off as a starting point to improving your model. The other change to the nose is the back dating of the marker lights. The photo I'm working to show a couple of fixed lights and several discs. I've removed the moulded lumps and drilled the holes for the former. The later will appear a bit further down the detailing route. In the meantime the whole nose has been lightly sanded and the door sides marked with an Olfa Plasticard cutter. Everyone focuses on a different thing when looking at a model (Oh err missus). For some, it't the chimney or roof detail, others the wheels and even some weirdos, the buffers. For me, a diesel such as the Class 26 I'm working on at present, look empty without a collection of dangly bits on the buffer beam. For many years IMHO the best thing you could do to a RTR model was add brake pipes etc. You'll not be surprised to know that I don't really understand most of the bits or their purpose but it doesn't really matter, some of them need to be there. In the 4mm world, you can pick up a nice detailing kit. In 3mm scale you have to do it yourself. Luckily the Plastruct rod I bought to do the springs is ideal. Being fat plastic with a wire core, it can be bent to shape but is fat enough to look right. The bends even wrinkle slightly which I think looks good. Pure wire would have been OK too but probably have require priming. I had to use it for the electrical (I think) loop under the buffer. It's not a complete set of course but I haven't worked out how to do the screw coupling and will dig around for something suitable in the commercial world. It's going to be painted black anyway so adding it at a later date won't be a problem. What sort of model maker do I aspire to be ? In the latest issue of the Gauge One Associations magazine, there are some photos of models by Attilio Mari. Not just shots of completed models but of the parts that make them up. The machining and assembly sequence of the "real thing"
A good number of non essential components with the appearance of the real ones, giving a better visual impression and sensation of completeness. So, the E626 loco has opening doors and compartments, working suspension and brake gear, real rivets and bolts, full interior detail etc. etc. It really is a work of art and took 4483 hours to create and assemble the 9280 components. No I marvel at people who can build a model like this. Every so often I wonder if I could do the same. Then reality strikes and I go back to bodging. Like most people I just can't stay committed to a single project for that length of time. In a similar situation was Peter Denny. He devoted his model making life to effectively a single layout. Certainly a single scale and era (apart from the garden layout of course), a doggedness he claimed allowed him to achieve as much as he did. In an era of zero useful RTR, he produced an extensive line in EM gauge by scratchbuilding everything. Maybe lots of scratchbuilding would do me good, but I like to have several projects on the go at once. 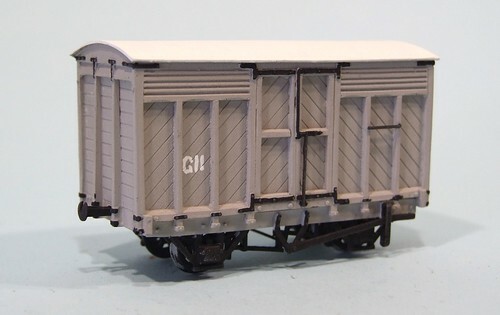 The current worklist includes a 7mm loco, G gauge van, 3mm diesel and some other stuff. I certainly couldn't be writing this blog, or at least expecting anyone to read it, if each day was "Made another rivet" or "Filed a bit of metal to a funny shape". I mean I'm good with the innovative text but not that good. So I'll carry on with my catholic tastes but I'll always wonder what I could have achieved if I'd stuck at one thing. Spring is in the air and some progress has been made on the garden railway. 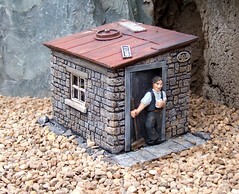 We now have a "stone" built lineside hut courtesy of a kit from Garden Railway Specialists. It's an interesting kit. Basically a set of walls and roof to be glued together with a nice big tube of "No More Nails" glue. I made some modifications as the supplied window is on the wring side for my purposes and so I had to knock a hole in the wall and do my own thing. Painting is with acrylic paints which appear to be the thing to use outdoors. The figure (sadly moulded in to the door) is done in enamel though so it will be interesting to see which one weathers best over time. The hut has a real purpose. It covers one end of a conduit carrying the mains supply for a water pump. The connections for the track power supply are in there too. Walking towards York Minster I spotted this rather lovely collection of buildings. Despite being near one of the most important religious buildings in the country, there is a certainly "higgledy piggledy" air to the layout that appeals to me. On the left is St Winfreds church, built in 1864 out of goo solid stone. Moving right there is a much more modern extension which is cleaner and sharper with simpler windows. 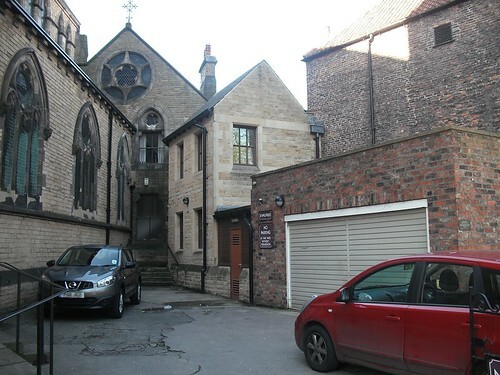 To the far right a brick built double garage that I suspect wouldn't get through the planning process nowadays. Interestingly, it and the building next door are in stretcher bond. I'd have expected English or Flemish bond as both pre-date cavity walls. Joining the two buildings up though is a lovely little wooden extension but a with a stone base. The door is vented which would indicate some electrical gubbins inside but it doesn't look that old unless someone has been around with the paintbrush recently. Other details - the wall lights are modern but the signs are hand painted so they have been around a while. As I say, I love these jumbled little corners. It's important on a railway layout to fill up every inch of space in some places - anywhere where land was expensive or the buildings could grown up over time. I'd have expected this sort of building to be found in an industrial setting but it just goes to show, inspiration can come from anywhere. Have a look yourself on Streetview. I love York, it's a beautiful city and as befits such a place, it has a couple of excellent model shops a few minutes walk from the very centre of town. 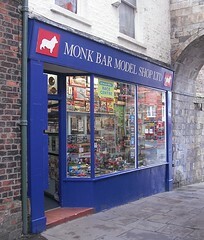 For railway modellers the Monk Bar Model shop is the first place to find.The windows display is a feast on its own. 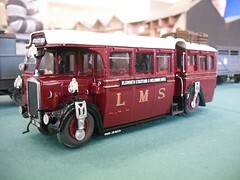 Inside, a huge range of Hornby, Bachmann etc. is available. The showcase displays of locomotives and rolling stock are one of the biggest I've seen for a long while. It's not just RTR either, loads of kits and bits to be found hanging on the walls along with a wide range of paint and materials. I get the feeling that there are enthusiasts working here judging by the range and number of magazines and catalogues decorating the counter tops. 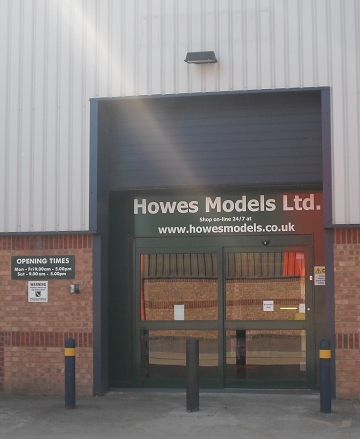 For the general modeller there is a reasonable range of plastic kits and loads of diecast vehicles at the front of the shop. Quite a bit of slot car stuff too. 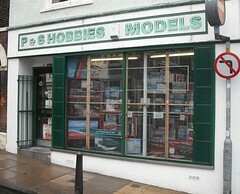 At the other end of the city (about 15 minutes walk from one to the other) is P&S Hobbies Models. This is where you come if you are into garden railways, radio control aircraft, boats or cars or (like me) just love a really crowded model shop where you have to squeeze in between piles of stock and get the chance to have a really good rummage around. When you walk in, on the left is a huge wall full of plastic kits. All sorts of things are stocked. I even found an Airfix set of England world cup stars ! It's not just the main ranges on sale either, there are plenty of the more esoteric military models for you to build. On the next wall and overhead are model boat kits. Again, there are the usual suspects along with one or two from eastern Europe that I'd not seen before. Quite a few fittings are stocked with more of the pricier items behind the counter. Don't miss the Billings rack at the front of the shop either. In a cubby hole at the back of the shop as well as some of the more prominent piles you find garden railway rolling stock and buildings. The cubby is a sea of LGB boxes but I know there is other stuff in there too. If I have a complaint it's that a couple of the sets were a bit buried such is a quantity of stock in there ! Because of the aircraft modelling customers, the range of glues, paints and materials is wide. You can buy different types of wood and plastic along with wing coverings and weird stuff I didn't recognise immediately. Right you lot, it has come to my attention that some of you are looking a bit, how shall we say, tubby. No a touch pudgy. No, still not right. I know - you are a bunch of monumental lard arses. We can't be having this so in future, all powered modelling tools will be banned. Instead you will have to power them all yourself. 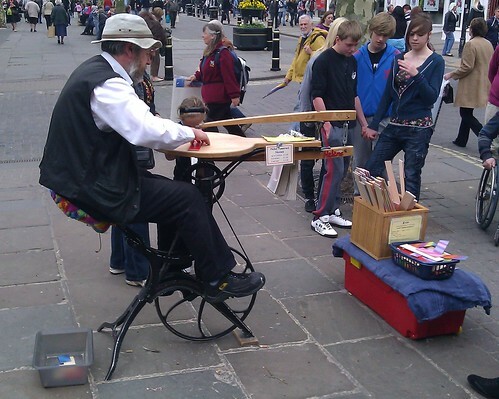 As an example I present the new eco-friendly and healthy cycle powered fretsaw. As you can see, the principle is simple enough - man turns pedals which works saw blade allowing him to cut through thin sections of wood. Effective and good for you. By the time you have created 300 feet of Highland Railway station valancing you will have worn off nearly three Mars Bars worth of chubbiness. Next we will be adapting the same tool to produce a pillar drill suitable for locomotive sideframes. Finally the foot powered lathe. Build yourself a 5 inch gauge locomotive using this and not only will you be at your idea wight, you'll have thighs that will see you an easy winner of the London 2012 Olympic cycling. Back in the good old days there was a business in the centre of the venerable city of Oxford. Yee Howes Olde Modele Shope, purveyors of the finest miniatures for the discerning gentle person was a must visit location if you were in town. After a few years the business moved out to the nearby town of Kidlington. This made it handier for those who would be travelling by the new fangled horseless carriage as it was just off the M40 motorway and there was a very good pub en-route. The business changed and in the front room became home to model railways while the larger back portion sold radio controlled boats, cars and aeroplanes. In between there was a room for plastic kits and an attic for bargains. Gradually mail-order became more important then punters walking through the door. The plastic kits were sold off while the RC section concentrated on the more profitable lines of ready to sail, drive or fly models. Now there has been another move to an industrial unit a mile or so down the road. Parking is much easier at this new venue and it's not difficult to find - just over the railway line if you are heading towards Banbury from the town. The different sides share a showroom and at first sight I wondered if the railways had diminished slightly. A bit more investigation makes me think this isn't the case although perhaps there isn't as much continental stuff as before. 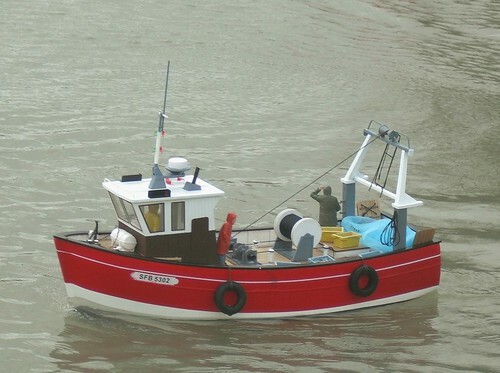 The plastic kits are back as are a lot of model boat fittings. There are, I think, more kits on sale too. The ready to use stuff is still there too with much more interesting models on display. The next door unit houses the main mail-order business so they don't need to keep as many multiples of items in the shop, which makes the place look a little less tawdry. In fact some of the RTR ships are very impressive - a 5 foot long warship anybody ? Normally I'd be a bit po-faced about all this but I really think the move is for the better. As a nautical modeller I like the range of Robbie fittings etc. on the wall. It's a struggle to find this stuff a lot of the time. The railway bits and pieces are good and the material selection including paints and glues excellent. Maybe those interested in trains will take a look and find some new items for the toolbox too ! A couple of hours with some packets from the Plastruct rack and bits of plasticard and I've manged to finish detailing the bogie sideframes on my 3mm scale Class 26 diesel. The results are still a bit wobbly but look good enough for me. It's interesting to conside the different types of plastic. Cutting the brake cylinders was simply a matter of rolling the plastic rod along the cutting mat under the knife blade. Amazingly I managed to get the cuts square and pretty clean first time. OK, so I managed to ping off a few bits into the depths of the bench but since you have to buy packs of 5 lengths of rod and I needed about 20cm of it, I had enough spare to not be bothered looking. Compared to the plasticard though, the material was quite brittle. This is brilliant for the job in hand but I wouldn't fancy working with a flat sheet of the stuff. From memory, Slaters put some rubber in the PlasticardTM mix which makes it a lot easier to use. Anyway, the sideframes look very nice on the model. I had to remove the fuel tanks and reposition them a bit as they were too close to one end once the bogies were finished. The important thing is that the area under the body is now full of plastic. I wonder if it's riding a bit high - maybe 4 thin washers under the bogie fixings would drop it down half a mm or so. Or maybe I'll leave well alone for the minute. I know the thing works on the layout as it is ! Railway modelling without the baggage ? Last week I railed against the idea that what I discover is called "high art" gets loads of money in grants but "low art" like railway modelling and other types of creativity that are enjoyed by the masses, get none. The comments that followed were interesting and (for me) educational. However this got me thinking. The problem is that for most people, the thought of doing something creative is an anathema. Years of being conditioned to sit and watch television or spend all day at work or ferrying the kids around (can't they go themselves or better still not have hundred of activities that take place miles away, or is it just to fill an adults empty life) means that the stock responses when shown a model by its proud creator are "Oh you must have a lot of patience, I couldn't do that." or "I wish I had the time for that sort of thing." Quite simply, people believe hobbies are for oddballs and not something that normal people do. Apart of course, from officially (because you can buy stuff labeled to say you can do it) sanctioned creativity such as making greetings cards - as if the world really needs any more ! So, what can I do about it ? I wonder if it is possible to run sessions where people make stuff. Trouble is, what I know how to make is railway models and therein lies a problem. You see to get people interested you can't do railways. There's too much baggage. Railway modellers are freaky weirdo trainspotter nerds who hang around at stations, smell horrible and probably fiddle with children. Who wants to be associated with them ? And yet the hobby itself is great. I mean it is good if you are a freaky weirdo but even better for a normal human. If I was to try and teach whittling or some other stand-a-lone skill it's great but where do you go with it ? I look at wood turners and while impressed with the results, wonder how many wooden bowels or vases any household needs. Building a layout sees lots of skills used and a whole range of tasks to carry out. So, the problem is, how to persuade a group of normal people to pay good money to sit down for a course in something. Could I get a grant for this ? How could we spread the word that is the joy of hobbies ? This is the last year that the 16mm Association will be holding it's AGM at Stoneleigh Park. Next year's event takes place at Peterborough. That means instead of a 15 minute drive, it's going to take a couple of hours. I still think I'll go though. As far as garden railway shows go, this is it. Everything you want under one roof. 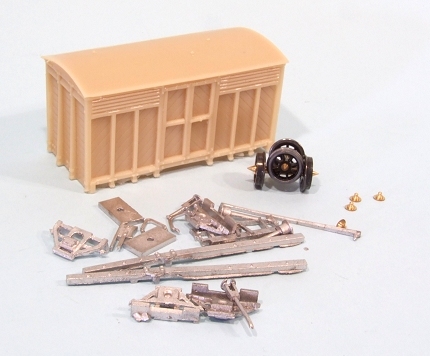 General traders, specialist traders, steam engines, wagons, coaches, RTR, kits and scratch building parts. Goodies made in clay, steel, concrete, brass, wood and resin. And there are some static displays and layouts too. For the full list of layouts and trade, head off to the assocaition website. A particular highlight for me, other than the new IP Engineering Manx Van and chatting to the legendary (in garden railway circles) Tag Gorton, was being able to see rolling stock from the Compton Down Railway. If you aren't a fan of old model railway magazines then this won't mean anything to you. 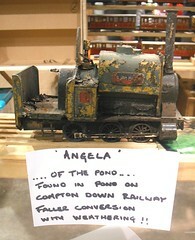 For me though it was one of the most interesting garden railways ever built. As a youngster I liked the idea that a lot of the rolling stock was scratchbuilt on to cheap chassis. The standards looked achievable but the overall impression was of a real railway, but in miniature. That's not surprising really, because Peter Jones was having the same problems I was at the time, lack of money but loads of ideas. Unlike me, he headed out to the garden and stuck at building his own, self contained line. Time has not been kind to the locos, but that doesn't matter. Someone built these for his railway show their origins and that is a good thing. In a hall where you can hand over 2 or 3 grand for a lovely live steam engine, models made of bits of wood and metal on a Hornby O gauge chassis show that this is a hobby for everyone. 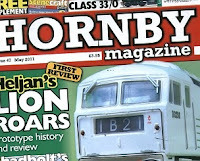 You will pleased (or not but I am and it's my blog) to spot a bumper crop of Parker articles in the May 2011 Hornby Magazine. No less than 12 pages this time. WooHoo ! First up, we have a new series of £20 projects. The idea is that you take your loco plus a couple of crisp tenners and personalise it. This time I've had a go at a J94 adding one of those Giesel chimneys, buffer beams and other stuff including a whole lot of dirt. Because I didn't read the instructions properly, I went wrong so this is the story of how I bodged it right. In The Clinic, a cherubic faced Phil answers some of your modelling questions including stuff about H&M Controllers, Z5's and brickwork. Finally, this month's Parkers Guide is one I'm really proud of. 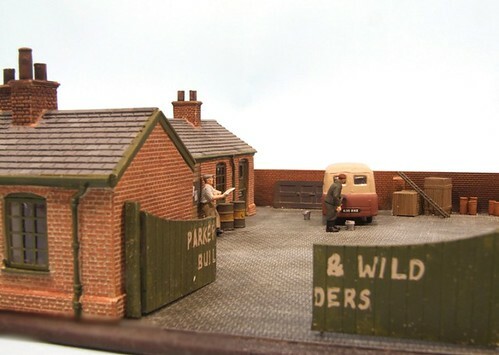 A pair of heavily modified Hornby Skaledale buildings. When I say heavily modified, I mean with the aid of a big saw from the DIY shop. The models didn't know what hit them and hopefully I've shown that no matter how good a resin building is, it can still be treated as raw materials for a unique model you can be proud of. This last one is probably my favourite project ever for the mag. I am really, really pleased with the results. After my reasonably succesful wood weathering experiments, I thought I might as well try the technique for real. Since the fishing boat Majestic was on the bench, and although I didn't want it to be dirty I felt the deck looked too pristine, it was the obvious candidate. The alcohol and shoe polish mix was painted on and initially sat between the planks. Drying it with a hairdryer showed that the wood surface was being affected, but it appears the desks come with a thin varnish on them. That's good as it stops thew wood warping if you take a wave on board, but I wasn't sure it would be so helpful for my purposes. After a couple more coats though I think the greying effect works well. In the sunshine the wood looks new but worn. A few more washes would have reduced it to a more faded huge. 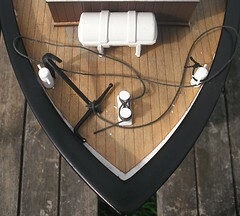 And I have another boat in the stash that needs to be a lot more careworn, so we;ll see how it pans out in the future. This boat has appeared on the blog before. 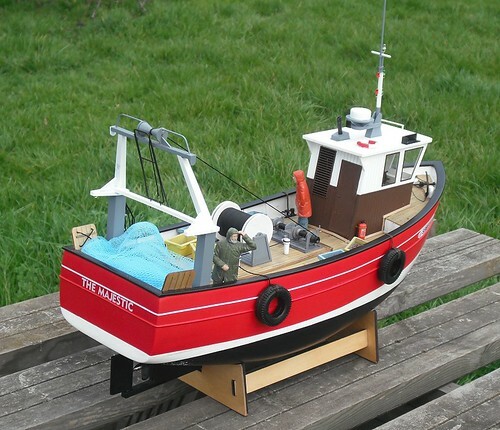 In essence, it's a ready-to-run modern fishing vessel from Thunder Tiger Models. 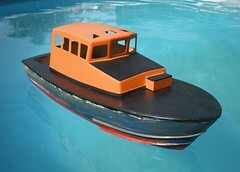 I like the good quality radio and control gear, the fibreglass hull and well detailed superstructure. I didn't like being able to see through the grille at the back of the engine bay, or that everyone else has one and they all look the same ! Finally though, my model has been personalised. A George Turner Models Crew are in control. Fish boxes, life raft, tyres, fire extinguisher and a net from Mac's Mouldings complete the accessorising. The wheelhouse was prised away from the deck and an engine cubicle built from plasticard. While doing this I found that the doors and grille are separate mouldings so can be popped out if you want. Maybe to leave the door ajar ? Inside the bridge the sailor has a floor to stand on and a map to guide him. There's loads of potential here but I wanted to do this quickly so didn't go to town on the job. The net was "interesting". It's a plastic mesh which as supplied is too springy. Rolling it up and hitting it with the heat from a hair dryer followed by a cold blast sorted this out rather better than I expected. There's still spring but the net now has more of the appearance of a heavy mesh. On the water, the boat works as well as ever but now I can sail without everyone thinking I'm a chequebook modeller. Unpainted wood exposed to the weather very quickly changes from a nice brown colour to a silver/grey. Replicating this on a model is more challenging than it ought to be. However, there are another group equally skilled - American railway modellers. As a regular reader of Narrow Gauge & Shortline Gazette, I've seen no end of beautifully weathered wooden shacks. Much of the success seems to be down to some weathering dyes available in the US. I have tried to order these but because of the chemical contained, they can't be shipped. Not to worry though as the makers apologised and then told me what was in there. 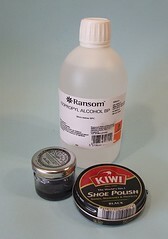 A mix of rubbing alcohol and boot polish ! Trawling around chemist shops, it seems that rubbing alcohol has long since been replaced by linaments such as "Deep Heat" but in an idependant shop the pharmasist, who seemed to know a bit of chemisty, suggested Isopropyl alcohol would be worth a try. 6 quid a bottle is worth it for a dabble. Mixxing the liquid with a little polish in a jar, I painted it on some plywood. Once dry it went silver. Rubbing the mix in gave a more subtle appearance and building up layers changes things further. It's certainly worth a bit more experimentation. 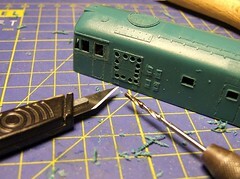 More fiddly work on the Class 26 diesel bogies. This time some cab steps. At least I was able to use some microstrip and not have to cut the stuff myself. Truth be told, this probably is an area where bending a bit of brass strip to form everything except the middle step would have made more sense. However since I have very little of that (load of brass strip though) I ploughed on with the plastic and lots of solvent. The finished product are a little bit wobbly but when you look at the loco on the layout, as long as the step position is OK relative to the cab doors I think I'll get away with it. On the plus side, those fake springs look nice don't they ? Even in close up the grooved rod looks pretty convincing. This weeks moans from the artistic community regarding the cuts to their funding from the Arts Council are both annoying and amusing. The luvvies are banging on about inclusiveness and yet they are running the more exclusive club in the world. You can be an artist in the UK only if you have been through the right training and live in the right places (specifically London or Brighton) and know the right people. I've probably mentioned this before but it appears that if you haven't been through the correct processes you can't be creative. Not in the slightest. Or not officially anymore. All this explains why someone like the English National Opera gets 18 million quid this year. On their website they boast that "37,000 saw a contemporary opera in 2009/10". 37,000 is less than twice the crowd that went to see the Warley show at the NEC the same year. And how much subsidy does the Warley club get for this ? Roughly £0. In fact they have to hire the venue and pay all the bills. So which is more inclusive ? My suggestion would be that some of this lovely arts cash should be going to promote the idea that everyone can be a little bit creative. Head over to Europe and you find events that use exhibition halls the size of the entire NEC and see 100,000 through the door in the three day period. That's nearly three times the ENO audience and more importantly, these are people who are active participants in their interest. I doubt many opera goers head home and start singing - no, for them it is (like football) a passive activity where they are merely audience. We live in a time of recession, some might say economic slump, and yet there are things people can do to lift the gloom. It seems that the main thing they are allowed to do is sit and consume television. How much better life would be if the world was full of people in sheds making stuff. OK, it might be rubbish but then for every prima ballerina there are a hundred wannabies, but it doesn't matter. The very act of taking something and creating is IMHO A Good Thing. Sometimes people will even make something useful. Yet if there is support, it's a very controlled version. You can go and try painting or weaving or pottery but you have to be told how to do so by someone qualified. A "proper" person. And you are then lead to believe that you can oly carry on with the "correct" materials and in the "correct" sort of place. In fact, to be honest, you probably shouldn't. Leave it to the experts. I mean it's not like we had any great artists who painted straight on to old boards did we ? So how do we make art inclusive instead of exclusive ? How do we wreast creativity from those who want to keep it for themselves ? Can ordinary people break into the caball of arty types ? 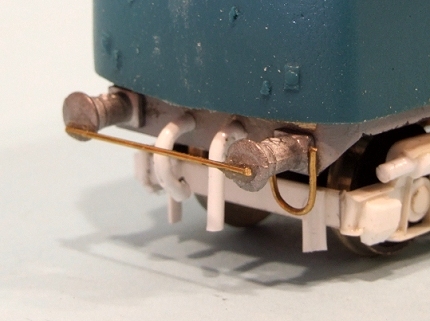 For the Class 26 diesel sideframes, I can't be bothered to mess around with real springs. The things would be flying in all directions when I try to hold them and anyway, they cost money. I wanted something cheap and easy. 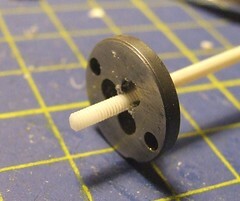 Since the sideframes are plastic, the obvious thing to do is to make the springs from the same material. At least it can be stuck with liquid glue. My cunning plan was to run an 8BA die up a plastic rod to give a nice grooved finish. The biggest problem was to find the right rod. From the Plastruct display there are a couple of possibilities. The 2mm version worked well but it has a steel wire in the centre which made it impossible to cut, even with a piercing saw, to an accurate length. Digging around in my materials pot I found a solid hard plastic rod. Not idea as I don't know exactly what the material is other than it seems to brittle for styrene. Getting the die up it was as tough as doing the same job on brass not helped by the difficulty holding the rod to stop it turning. I've no idea where this stuff came from, it might even have been salvaged from some rubbish, but I'll look out for some more in the future. The results look nice to me. I'll stick them to the frames and let you know how I get on next week.